My dog has been particularly curious recently. Lots of sniffing, cautious cat approaches, and lingering looks towards where rabbits used to be. Maybe it’s the effects of longer days and more sun, but it’s certainly lifted whatever winter ennui Sofie had been feeling. 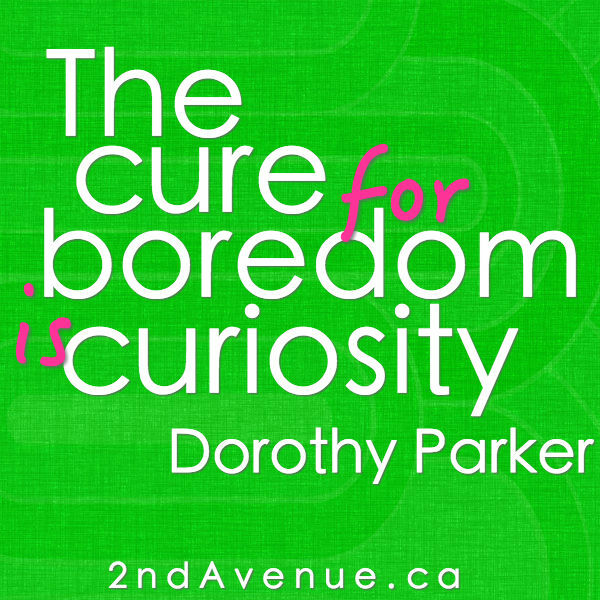 It’s made me think of the Dorothy Parker quote below as there’s certainly no cure for Sofie’s curiosity, which borders on obsession! By nature I am not fearless. 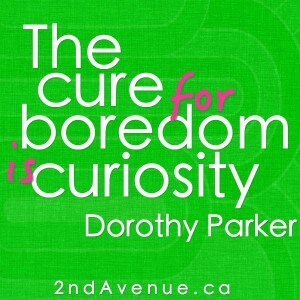 I am a worrier, a planner, a nail-biting worst-case-scenario imaginer. 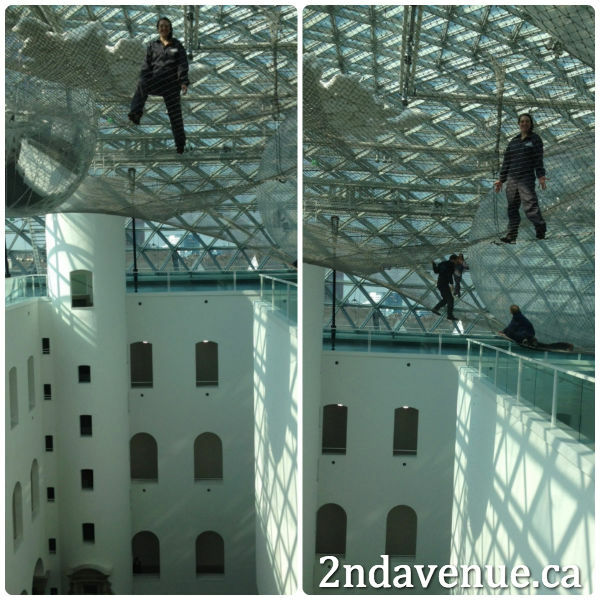 But somehow, suspended more than 25 metres (82 feet or around five stories) above a marble floor on steel mesh, I became unflinchingly brave. We went to K21 last week specifically to see in orbit – an interactive exhibit by Tomás Saraceno. K21 is one of the three venues of the Kunstsammlung Nordrhein-Westfalen (or state art collection) in Düsseldorf and in orbit is the largest piece they’ve ever displayed. It’s made up of three interconnected levels of steel mesh, interspersed with giant inflated spheres and suspended under the glass roof of the Ständehaus building. Saraceno was inspired by spiderwebs and spent years studying how different species create different patterns. in orbit is huge and strange and amazing from all perspectives – particularly from within. Visitors can don coveralls and climb into the structure; becoming part of the exhibit, altering the tension on the steel wires, and interacting with each other and those watching. While waiting to get into the coveralls, I was impatient. During the very short safety briefing, I started to get a bit anxious. And then walking up the scaffolding (which felt less than rock solid), the butterflies started. As I trepidatiously put a first foot on the mesh, my heart was pounding. Looking down and seeing the polished stone floor five floors below, I began to think this was a bad idea. I quickly dropped my bum onto the mesh out a self-preserving instinct that increased physical contact would mean increased safety. The path of least resistance led to a steep down-slope and before I knew it I was sliding down the mesh as though it was snow and I was on a toboggan. That slide brought on a childlike sense of elation and my nervousness evaporated. While part of my brain still screamed “Stop!” when I moved from overlapping layers of mesh to a single stratum, I got quite comfortable being suspended. I climbed the ‘walls,’ attempted a couple yoga poses, flopped onto the pillows, ‘swam’ on my belly, marveled at the huge blown-up spheres, clambered along the wires, reveled in the novelty of walking on air… all while I grinned madly. 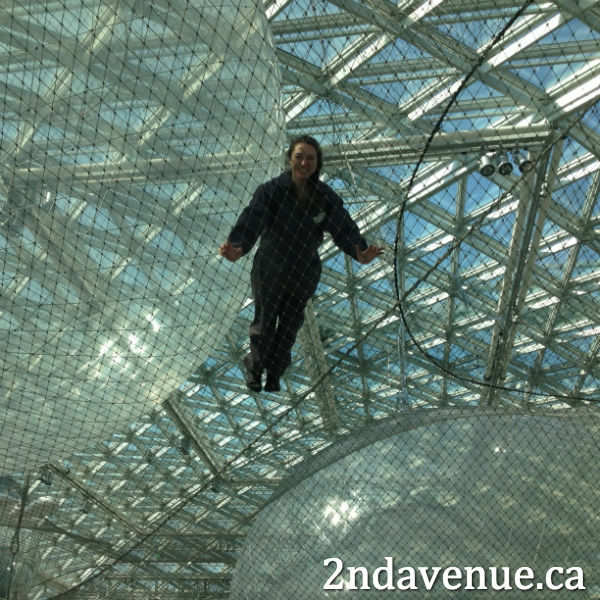 I could not anticipate my fearlessness before stepping onto the mesh, but there it was. Brave, adventurous, blithely embracing the amazingness of the moment. 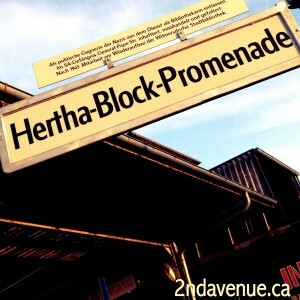 On my first walk through our new neighbourhood I noticed black stickers with chalk writing on a number of doors. I paid closer attention on subsequent walks and started noticing actual chalk on doorways as well. Algebra on door frames? A complicated census system? A formula for garbage pick-up? 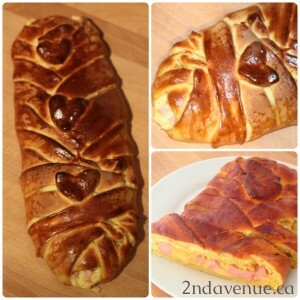 Given that Lent had just begun and I hadn’t noticed anything like this before, I theorized that the markings had something to do with Easter. A bit of research revealed that I was right about their religious nature, but wrong about the occasion. 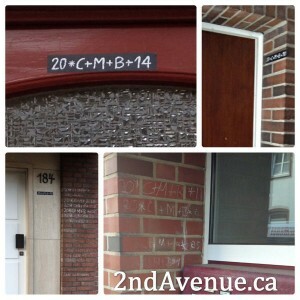 The chalk markings are a traditional Catholic house blessing in Germany done around Epiphany (6 January) every year. The digits represent the year to come (2014 in the picture at top left) and the letters stand for either the Latin blessing Christus mansionem benedicat (Christ bless this house) or names of the three wise men (Caspar, Melchior, and Balthasar). The mathematical operators have folkloric meaning as well: the multiplication sign or asterisk (*) is for the Star of Bethlehem and the plus symbols (+++) represent the trinity of Father, Son, and Holy Spirit. While the majority of doorways in our neighbourhood are unmarked, there are sizable number that have been chalked and some even have long lists from previous years. It’s clear that Neuss is more Catholic (or at least more into chalk and blessings!) than Berlin as there’s a whole set of traditions around Epiphany that we didn’t see any trace of in Germany’s more secular capital. Learning about local traditions like this is one of the reasons that my husband and I wanted to live in different regions of Germany. Exploring a different country from a less-tourist perspective was a motivating factor for starting this adventure and it’s fantastic when those explorations lead to a little more understanding of local customs. And with Easter just around the corner, who knows what other new-to-us traditions will pop up! Spring weather is unpredictable everywhere. Thursday was all bright sunshine and warmth. Yesterday I got caught in a hailstorm on my way back from yoga and then the sun set on nearly cloudless skies. Today is cloudy with a cold wind. And who knows what Spring has in store tomorrow! 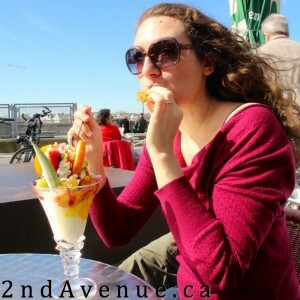 We ‘sprung’ at the chance to enjoy the fantastic weather and spent Thursday afternoon in Düsseldorf. It’s easy to like a city when the weather’s good – it helps that there were lots of ice cream parlours and a plethora of breweries, too! 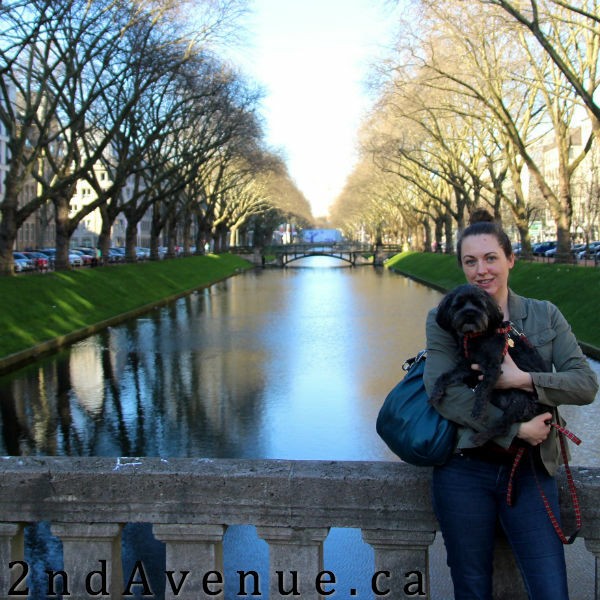 We walked along the Rhineuferpromenade (river-side pedestrian/bike path) from Altstadt (the old town) with its narrow cobbled streets and many shops to Mediahafen (a former harbour that’s now filled with restaurants, shops, and modern architecture). Sofie stalked pigeons, we shed layers of clothing, and very much enjoyed meandering along the Rhine. Lots of locals (and some tourists, as well) were out enjoying the sun, ice cream, and beer, which made for excellent people watching. Düsseldorf is known for being fashionable and there were many stylish dressers who did not disappoint. The overall dapper-ness was, however, kept in check by the disproportionate number of leather vests and badly highlighted hair! The proximity of so many cities with different conventions, style, architecture, and cuisine (and beer!) gives us some incredible opportunities for short trips. Since arriving in Neuss, we’ve sipped Kölsch (the local beer) in Köln; walked Europe’s largest outdoor market in Liège, Belgium; bought ‘cheap’ gas in Luxembourg; driven through the East Cantons, Belgium’s German region; and celebrated the first official day of Spring in Düsseldorf. We plan on ‘springing’ on travel opportunities as much as possible. Given that there’s a train station about five minutes away that connects us to many other interesting cities in Germany, Luxembourg, Belgium, the Netherlands, and France, we’ve got no excuse! Today was the original date for camper-return. 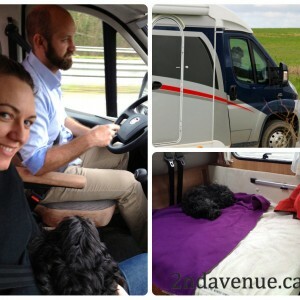 Instead, the camper went back four days ago and we slipped into our flat in Neuss a few days early. We are not camper people. We had grand plans for our 22-days touring around Europe: western Germany, Luxembourg, eastern and southern France, Monaco, northern Italy, Andorra, Spain, and maybe even Portugal. The difficulties driving the camper, problems finding campsites that met our needs, and the challenges of getting into cities to see their sights humbled our ambitions – and necessitated changing our tactics. Instead of hopping from place to place, discovering a new area daily, we stayed at campsites we liked for a couple nights and left the camper parked for a day or two at a time to explore. We stayed in rural Luxembourg and used their nation-wide public transit system to get to the capital (unoriginally also named Luxembourg). 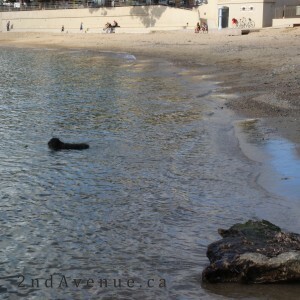 We camped outside of Saint-Tropez and wandered Mediterranean beaches. We stayed on two different vineyards and sampled French wines with the winemakers. We saw Mont St. Michel, the Bayeux Tapestry, and Juno Beach. We gawked at Notre Dame in Chartres and a few other churches. What we didn’t do was go into larger cities or travel nearly as far as we thought we would. Plans to meet up with someone in Dijon were abandoned. A trip into Grenoble to visit a friend was pushed aside. Any hopes of gambling in Monaco were dashed. Andorra’s narrow streets and lack of major highways scared us away. The navigational and language barriers of Italy and Spain felt insurmountable. Portugal was just too damn far. It was a radically different trip than anticipated. 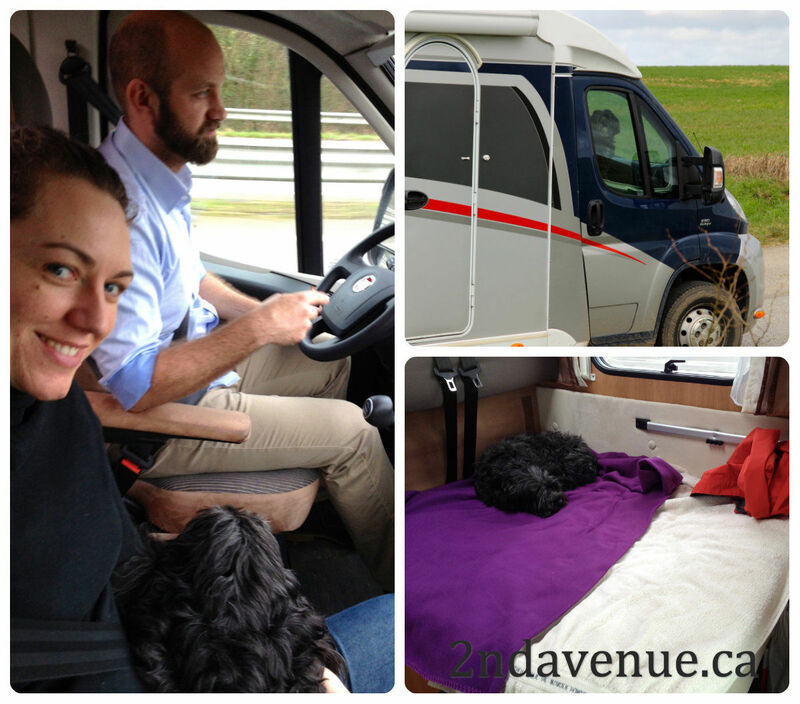 We saw rural Germany, Luxembourg, and France in a way we could have never expected – partially because the GPS had no way of knowing how terrifying single-lane country roads are in a camper! We also learnt about places we didn’t know existed and revelled in continually finding historic markers. We drove along the winding Mosel wine route and crossed the towering Île de Ré bridge. We visited war cemeteries and paid our respects to those who fell in the two world wars. We communicated in rusty French (me) or broken German (my husband) because we had no other choice in the countryside. We bought a baguette nearly every day in France and consumed huge volumes of paté and cheese. We suffered through wind and rain storms at three separate campsites – including one overlooking the high waves of the Atlantic. And parts of the trip made our dog pretty happy. Sofie got to swim in the Mediterranean, chase a ball on a beach in Normandy, drive long distances either sitting on my lap or curled up on her camper bed, sample French paté, and she spent a lot of time with us. In the end, we accomplished my dream of getting somewhere warm in February, didn’t have any catastrophic fights, saw some amazing sights, ate some fantastic food, drove more than 5000 kilometres, and, perhaps most of all, solidified our status as non-campers. Roughly four months after we arrived in Berlin, our bags are packed for our next location. We’re embarking on a three week camper trip and then spending two months in Neuss (across the Rhine from Düsseldorf). Our time in the camper will be an adventure in free-form travelling as we have a very loose outline of where we’re going. Likely into Luxembourg, France, and Italy… possibly into Andorra, Spain, Switzerland, and Monaco. 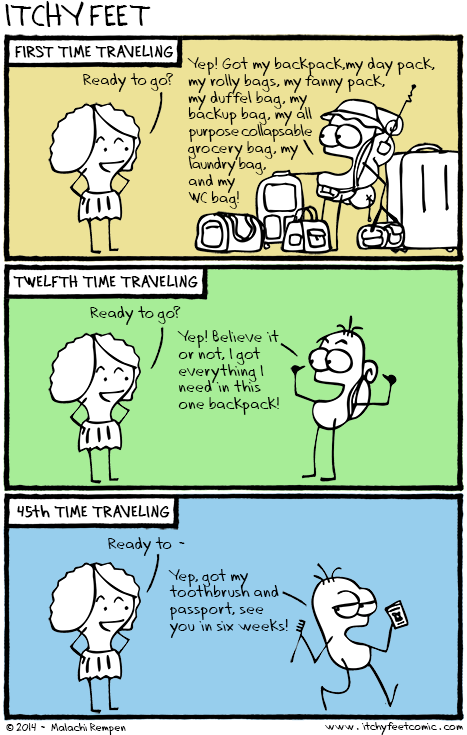 Wherever we go, we’re taking all of our stuff with us – although, thankfully, there’s not that much to carry! While we didn’t come to Germany with a lot (three hockey bags, two laptops and other necessary electronics, and some dog paraphernalia), we’ve trimmed down our possessions even more. And considering that we pared down what we already thought were the bare basics before flying to Germany in November, it’s amazing that there’s anything more for us to purge! Itchy Feet published this comic the other day and it fits perfectly with how we’ve reduced our cargo… and will likely continue to do so. A year ago, we had a fully furnished, well-equipped two bedroom condo and no idea that we’d be travelling so much. Our downsizing started about this time last year in preparation for renovations and continued through our initial discussions about moving. We dragged our three packed-to-the-brim, overweight hockey bags to Calgary… and left about a quarter of their contents there. And while in Berlin we’ve probably let go of another 25%. Not quite at the passport and toothbrush stage, but getting closer! It’s part terrifying and part liberating to have so little. It does make us a lot more mobile 🙂 , but can also feel a bit empty. Thankfully, we’re able to fill any emptiness with amazing experiences, fabulous digital photos, and lots of incredible memories. I suspect we’ll be back to Berlin to visit (or at least explore the city when it’s not so cold! ), but it’s farewell for now. The excess cargo, on the other hand, might be gone for good!